KMT Waterjet Systems ADS Series Abrasive Hoppers for Waterjet Machines are easily re-filled during the cutting process---no need to stop cutting! Waterjet machines production reliability can be ensured with constant abrasive flow rate with the garnet or grit. This fact becomes even more important when cutting brittle materials such as stone, marble or glass. The ADS Series abrasive hoppers precisely monitors the availability of sufficient abrasive closely during the entire cutting process. This protects your valuable material from damage and saves unnecessary costs and time. It‘s concept assures process stability, security and a very high degree of reliability. The ADS SERIES HOPPERS used in the hydro-abrasive cutting process provides a new level of accuracy and convenience in production cutting operations. 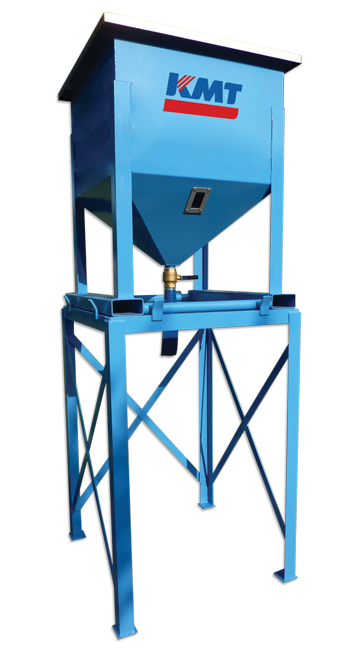 Abrasive is stored in the abrasive storage vessel and pneumatically transferred to the abrasive metering assembly. The New Superline Abrasive Tower is the perfect way to improve your waterjet operations. Designed to work with 2,200 lbs. super sacks of abrasive, this state-of-the-art abrasive solution allows you to fill your hopper with more abrasive so you can keep cutting longer. Reduce abrasive fill time compared to hand loading, and save on costs with KMT Genuine Parts super sack value options. Designed for heavy duty use, the Superline Abrasive Tower will hold a one-ton super sack, plus additional reserve weight. The rigid steel construction provides a unique combination of safety, reliability, and durability. Matched with a lightweight aluminum cover for convenient loading and abrasive protection. 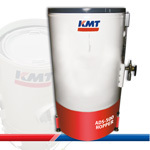 The Superline fits over all standard bulk hoppers including the KMT ADS Series Hoppers for convenient abrasive storage.